The Elite Aluminum System is lightweight, durable and easy to set up. 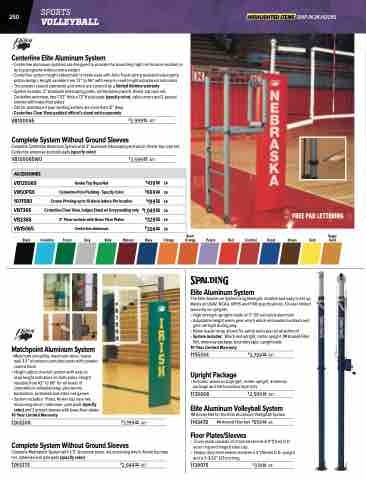 Meets all USAV, NCAA, NFHS and FIVB specifications. 10-year limited warranty on uprights. • Cover plate consists of chromed steel 6-3/4”(17cm) O.D. outer ring and hinged steel cap. • Heavy-dutysteelsleevereceivesa3”(76mm)O.D.upright and is 9-3/32” (23cm) long.